Emory Healthcare is the largest and most comprehensive health system in Georgia. 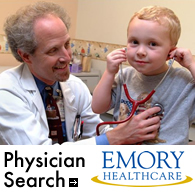 Committed to making people healthy by delivering the highest quality patient care, founded on world-class biomedical research, Emory Healthcare provides services at a number of Emory-owned sites in the Atlanta metropolitan area. View more information on Emory Healthcare. To make referrals quickly and easily to our system, please call the Emory Physician Consult Line at 404-778-5050 or 1-800-22-EMORY (1-800-223-6679) between 7 a.m. until 7 p.m., M-F. Visit emoryhealthcare.org for more info. HealthConnection is a direct line to registered nurses and representatives who can answer almost any question you may have regarding health information or Emory Healthcare. Monthly tips and news from Emory Healthcare — designed to keep patients healthy and informed. Emory Healthcare's online patient guide offers helpful tips on planning your visit, from where to park to what to bring with you when you go in for surgery. Patients please call Emory HealthConnection, 404-778-7777 or 1-800-75-EMORY, 7 a.m. - 7 p.m. EST (M-F). Or visit www.emoryhealthcare.org. Now you can follow the latest patient news by following Emory Healthcare on Twitter. You can also show your support by becoming friends with Emory Healthcare on Facebook.